The primary goal of the Elemental Imaging Division is to examine the differential spatial and temporal distribution of metals in biological samples in order to better understand the mechanism by which environmental exposures contribute to disease etiology. 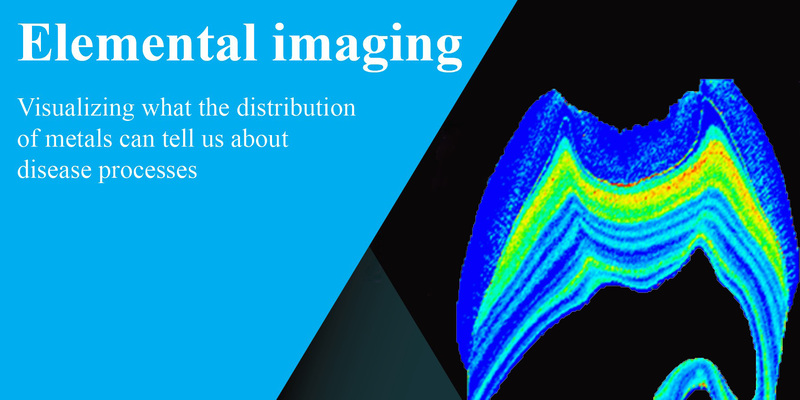 Elemental imaging utilizes a combination of analytical chemistry, microscopy, and data visualization to to depict the spatial distribution of chemicals in environmental and biological samples. This approach has the advantage of visualizing cell- and tissue-specific uptake and distribution of chemicals at the micro scale, as opposed to traditional methods that generally provide one averaged concentration for a sample. Imaging of isotope-specific tracers and fluorescent sensors can be employed to probe the mechanisms of metal transport (e.g. between the mother and fetus across the placenta, or across the blood-brain barrier), as well as in many diseases where metals are suspected to play a significant role. Our Laboratory uses the following techniques to study the distribution of lead, manganese, zinc, iron and other biologically important elements and toxic metals in samples including teeth, bone, brain, placenta, hair samples and many other tissue types. [Image above: Barium distribution on the cut face of a macaque tooth showing marked banding pattern due to stress events experienced by the animal. The image was generated by rastering a laser beam across the surface of the tooth and measuring the spatial distribution of multiple elements in a mass spectrometer. Credit: Christine Austin, Manish Arora].